Are you a Williams-Sonoma fan? I love browsing their kitchenwares and dishes dreaming of owning a solid brass coffee maker (or some such luxury), but mostly think of them as the purveyors of gourmet food and fancy-schmancy cookware. 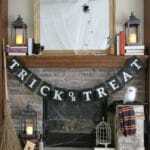 Imagine my surprise when I saw them offering adorable Halloween decorations including a Crow Wreath (it was resting comfortably between the $35 pumpkin macaroons and the $49 chocolate caramel skulls). 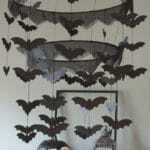 The wreath is made from black grapevine, Spanish moss and a crow who calls to mind Edgar Allan Poe’s “The Raven.” As I mentioned in my PB Kids Inspired Bat Chandelier post, I like Halloween decorations that are interesting but not gory or scary. 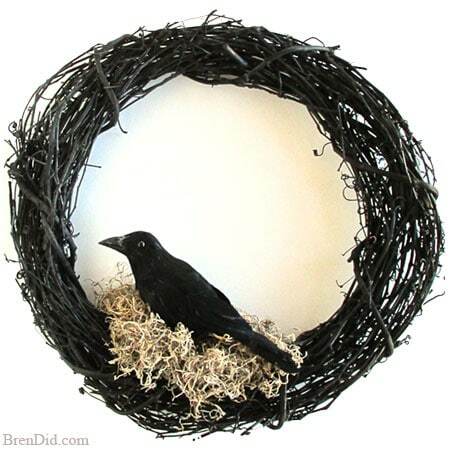 This distinguished raven (and his cosy nest wreath) fit the bill, however his price did not fit my budget. He stood there mocking me (Nevermore, Nevermore) with his $69.95 tag. 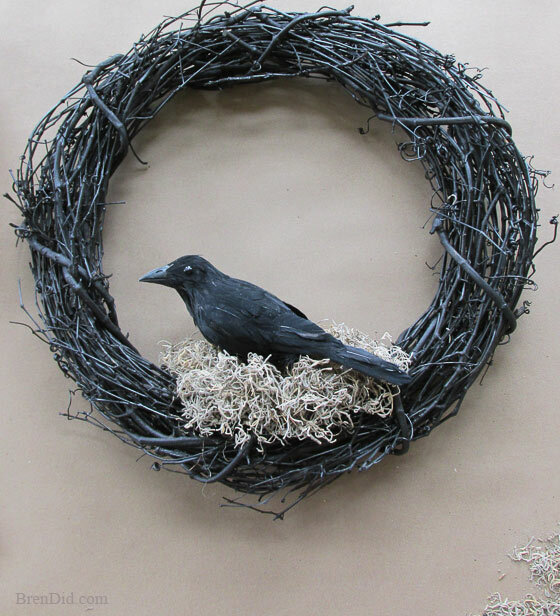 I decided that I would recreate that crow (and his little wreath too) for a lot less than $70. 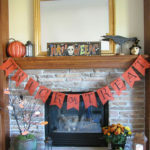 I headed over to my local craft stores and discovered that it was a surprisingly simple and cheap knock off! 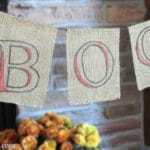 There is no sewing, gluing or nailing involved…. 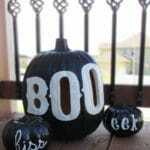 so if you are new to crafting this just might be your project! 2. 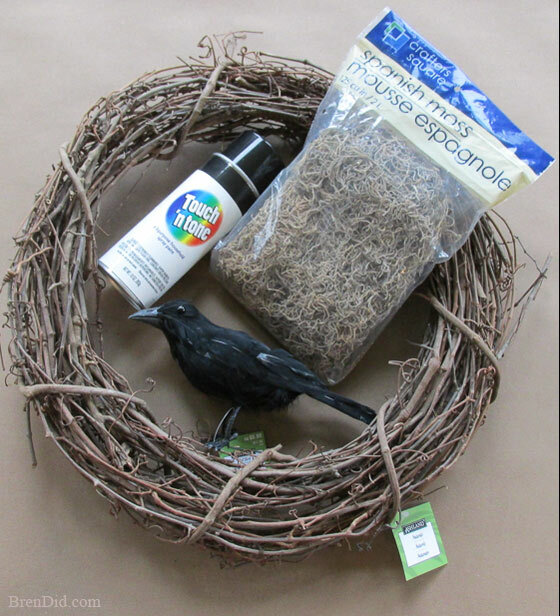 Spray a grapevine wreath black. I used cheap $1 spray paint. It worked great, but took a few coats as the grapevine really soaks up the paint. 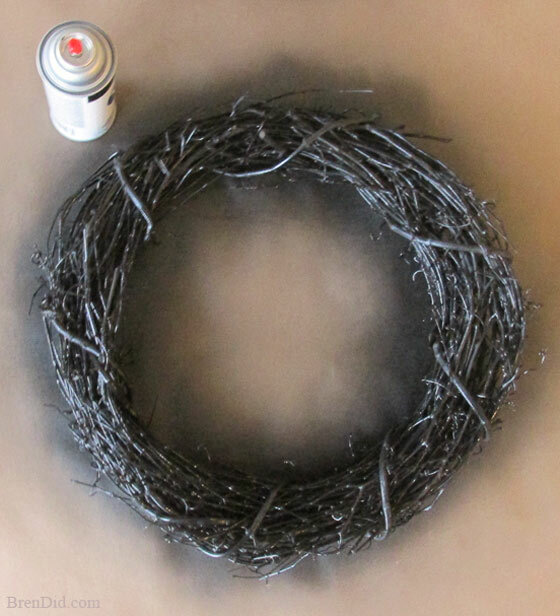 Make sure to check the wreath from a few angles to get it well coated. Allow the wreath to dry completely. 3. 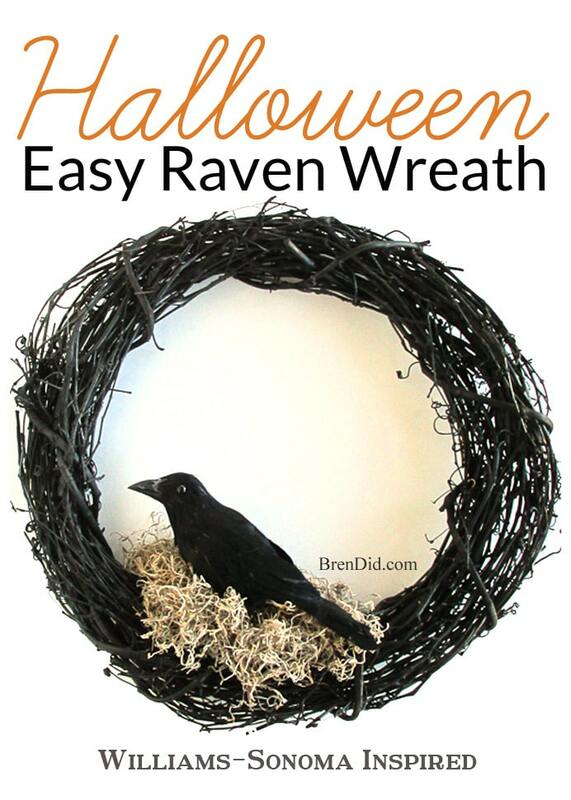 Attach the raven to the wreath using the wire attached to his feet. I simple bent the wire until it fit securely under a thick piece of grapevine. 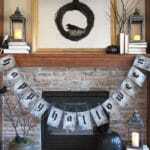 If yours does not have wire you can use black yard or twine to tie him to the grapevine. You will not see his feet once the wreath is finished. 4. 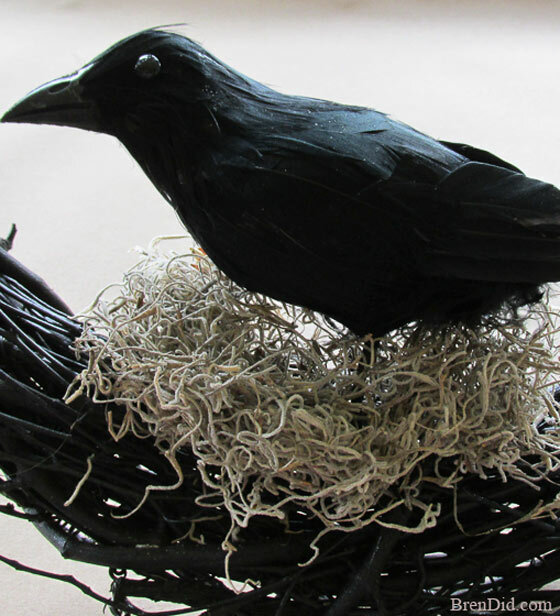 Use Spanish moss to make your raven a cozy little nest. 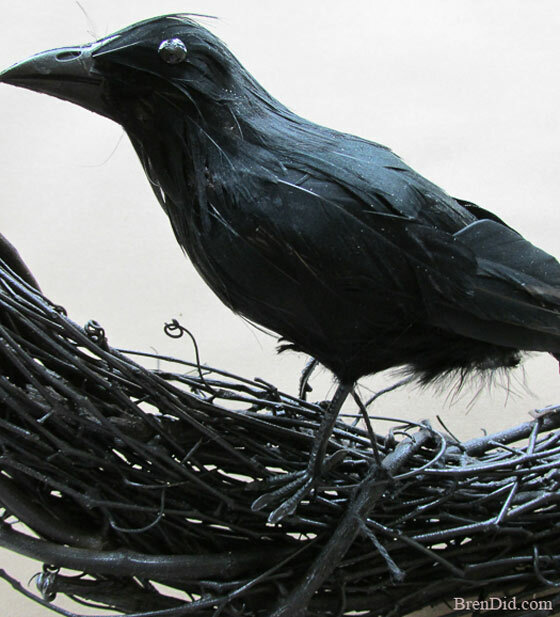 It works well to make 3 or 4 smaller bundles of the moss and nestle them under the front sides and rear of the bird. Cover his feet completely so he looks like he is nesting (and his little raven toes stay warm). 5. Hang your wreath! I tied a little piece of black twine to the back to hang the wreath from the front door. 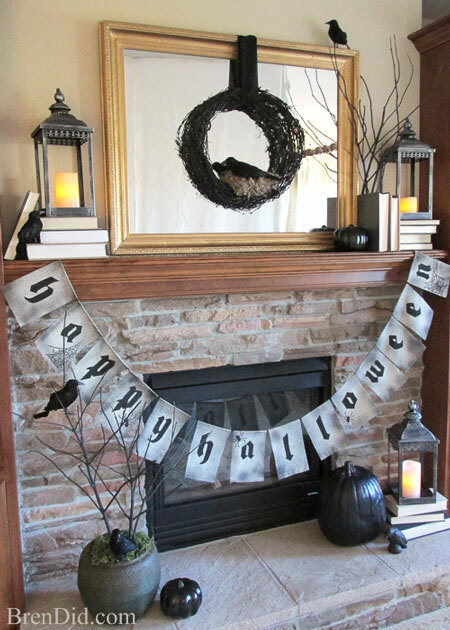 I also like how the wreath looks hanging from sheer black ribbon over the mantle. 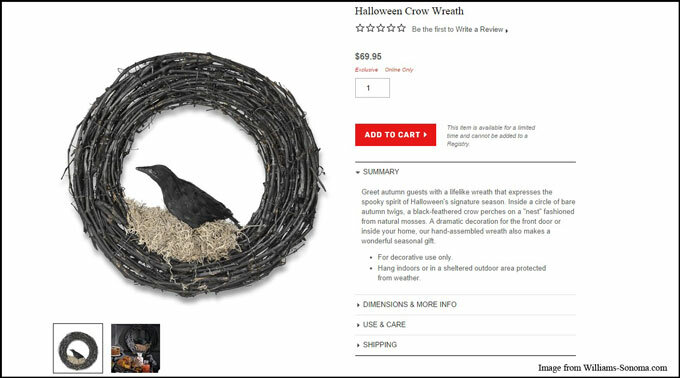 This stately Raven wreath makes an impressive Halloween decoration AND I can torture my children by answering all questions with “Quoth the Raven…” You can perch it on your mantle, front porch or even above your chamber door (too many Poe puns?). The best part? I didn't have to part with $70 to add it to my Halloween collection! That's a $59.76 savings (85% off if you’re into saving details). I LOVE those savings even more than my terrible Poe jokes! 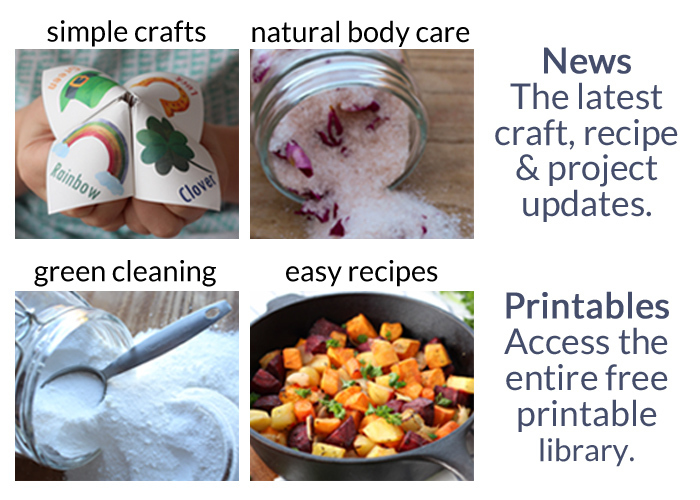 Sign up for my free email newsletter and never miss anther project. Well done! I love the simplicity of this, as well as the bargain price! Thanks Kelly! It’s such an easy project too!